Panosoft respects individual privacy. Panosoft strives to collect and use personal information in a manner consistent with the laws of the countries in which it does business. If you have questions or concerns regarding this Policy, you should first contact: support@panosoft.com. We may disclose Personal Information when required by law or regulation or in the good faith belief that such action is necessary in order to conform to the edicts of the law, comply with legal mandates, or to protect the rights, property, or personal safety of Panosoft, its employees, users and the public. We may use personal information we obtain relating to you, including but not limited to your name, mailing address, phone number and email address, for the purposes of contacting you, conducting internal business research. In order to use a Panosoft Website, you may first need to complete a registration form and/or create a user name and password. During registration, you may be required to give contact information (such as name, phone number and email address). This information may be used to contact you about our services. When registering on a Panosoft Website, you may have the option of receiving different communications from Panosoft. These may options include promotional information, press releases and newsletters. From time to time we may send our visitors and/or clients e-mail messages with new site feature announcements, enhancements, maintenance information and general updates. We provide you the opportunity to ‘opt-out’ of having your personally identifiable information used for certain purposes, when we ask for this information. If you no longer wish to receive our newsletter and promotional communications, you may opt-out of receiving them by following the instructions included in each newsletter or communication or you may contact us at: (877) 558-8526, email us at: support@panosoft.com, or send written notification to the attention of Panosoft, 32932 Pacific Coast Highway #14-482 Dana Point, CA 92629. We communicate with users on a regular basis to provide requested services and in response to issues relating to your account via email or phone. From time to time we collect and store information generated through use of our on-line services. We may use some of this information in the aggregate for marketing research, such as, for example, in compiling statistics on Panosoft’s website visitors and in assessing clients’ business needs. We may create standard usage logs through our web server, such as IP address, browser type, and access times. We use our web server to recognize your domain name and track your use of any Panosoft website. We may request certain information from you (such as your name, address, telephone number, e-mail address or business requirements) to help us evaluate our site traffic and overall usage, improve our on-line services, and build better websites. In some cases, we may not be able to remove your personal information, in which case we will let you know if we are unable to do so and why. We may post customer testimonials on our web site which may contain personally identifiable information such as the customer’s name. We obtain the customer’s consent prior to posting the testimonial. If you wish to request the removal of your testimonial you may contact us at the information below. 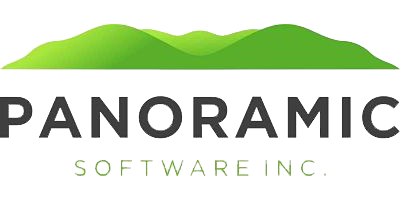 Panoramic Software, Inc. is the sole owner of the information collected on www.panosoft.com. If you purchase services from us, we request certain personally identifiable information from you on our order form. You must provide contact information (such as name, email, and address) and financial information (such as credit card number, expiration date). We use this information for billing purposes and to fill your orders. If we have trouble processing an order, we will use this information to contact you. This information is also used to send you updates on the product or service you purchased. Panosoft uses third parties to process the credit card transactions. The billing information is not stored on Panosoft’s servers. For our web systems on which you have a user account, you have access to your information to update and maintain your profile. It is solely your responsibility to maintain the confidentiality of your password. If you believe your password has been compromised, please contact: support@panosoft.com. If your personally identifiable information changes, you may correct, update, delete or deactivate it by emailing: support@panosoft.com. Panosoft will respond to your request within thirty (30) days of receiving the request. Your account may be active for as long as needed to provide you services and comply with our legal obligations, resolve disputes, and enforce our agreements. We follow generally accepted industry standards to protect the personal information submitted to us, both during transmission and once we receive it. When you enter sensitive information (such as a personally identifiable information) on our platform, we encrypt the transmission of that information using secure socket layer technology (SSL). No method of transmission over the Internet, or method of electronic storage, is 100% secure, however. Therefore, while we strive to use commercially acceptable means to protect your personal information, we cannot guarantee its absolute security. If you have any questions about security on our Web site, you can send email us at support@panosoft.com. Panosoft does not track its customers over time and across third party website to provide targeted advertising and therefore does not respond to Do Not Track (DNT) signals. However, some third-party sites to keep track of your browsing activities when they serve you content, which enables them to tailor what they present to you. If you are visiting such sites, your web browser should allow you to set the DNT signal on your browser so that third parties (particularly advertisers) know you do not want to be tracked. Because it supplies a hosted system, Panosoft operates as a data processor for its customers. Panosoft’s customers act as data controllers. Individual users involved in Veteran case management activities may interact directly with Panosoft’s customers rather than with Panosoft. Panosoft provides its customers with the option of disclosing their relationship with Panosoft by providing notice to individual veteran seeking the assistance of the customer regarding the Panosoft technology that they use. Panosoft maintains only that Personal Information which its customers have asked Panosoft to process. It is the Panosoft customer’s responsibility to ensure that the data the customer collects can be legally collected in the country and state of origin. The Panosoft customer is responsible for giving its employees, applicants and users the appropriate level of notification that Personal Information is being collected and maintained. Panosoft is a domestic California corporation operating in the United States of America. We have developed data practices designed to assure Personal Information is appropriately protected. In addition, we may employ other companies and individuals to perform functions on our behalf. If we disclose Personal Information to a third party or to Panosoft employees outside of the United States, we will ensure that such party has agreed to abide by the principles of this policy, or can otherwise assure adequate protection of such Personal Information. Panosoft will use Personal Information only in ways compatible with the purpose for which it was collected or authorized by our customers. Panosoft is committed to ensuring the security of the Personal Information that it processes. To prevent unauthorized access or disclosure, maintain data accuracy, and ensure the appropriate use of Personal Information, Panosoft has adopted appropriate physical, electronic, and managerial procedures to safeguard and secure the Personal Information we process. Panosoft strives to protect the privacy of the Personal Information it processes, and inadvertent disclosure is unlikely. In the event of such an inadvertent disclosure, Panosoft will take all commercially reasonable steps to limit and remedy the disclosure. However, Panosoft cannot guarantee that unauthorized third parties will never be able to defeat those procedures or use Personal Information for improper purposes. In most cases, when Panosoft collects Personal Information, it does so on behalf of another company, state, local, or other government agency (as an agent or data processor). To request access to, correction, amendment or deletion of this Personal Information, a user should contact the company or agency to which the data was provided. Panosoft has a Privacy Officer who is responsible for Panosoft’s compliance with and enforcement of this Policy. Panosoft’s Privacy Officer is available to any of its employees, customers, vendors, business partners, or others who may have questions concerning this Policy or data security practices. Panosoft’s Privacy Officer may be contacted by email to: jeff@panosoft.com. Panosoft has agreed to cooperate with Data Protection Authorities. Any questions, comments or complaints about the data practices (including, without limitation, compliance with data privacy principles of notice, choice, onward transfer, access, security, data integrity, or enforcement) of a hosted software customer for which Panosoft processes data should be addressed to that customer. Panosoft is committed to protecting the privacy needs of children and we encourage parents and guardians to take an active role in their children’s online activities and interests. Panosoft does not knowingly collect information from children under the age of 13 and Panosoft does not target its website or its products to children under the age of 13.